Here are a few of the different pop up rigs that I have used to catch many carp in the past. I rarely use pop ups for my fishing these days, I would estimate that I use them about 10% of my fishing time. Instead I prefer to use an over-weighted pop-up rig or critically balanced fishing rigs as I feel these have a greater chance of fooling the bigger, wiser carp. There will always be various situations where a pop up presentation would be an advantage, so I have placed a selection of photos below showing various ways to present a pop-up boilie. 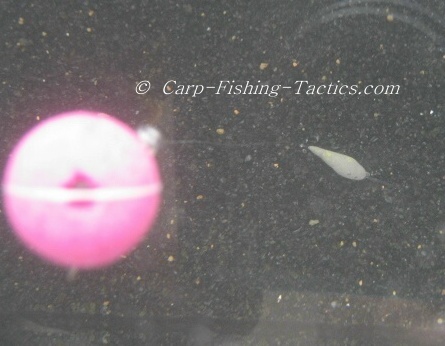 The good thing about this pop-up presentation is the swivel allows the hook and bait to rotate independently. 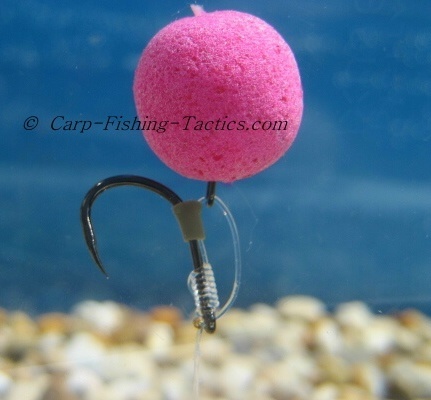 The swivel also provides some separation between the boilie and hook, this can make it harder for the whole lot to enter the mouth, but it also makes it harder for the carp to eject the hook bait quickly. The variation of pop up fishing rig has the boilie mounted on the shank of the hook. The pop up boilie was attached by drilling the bait and threading a bait band through the hole and securing with a bait stop. 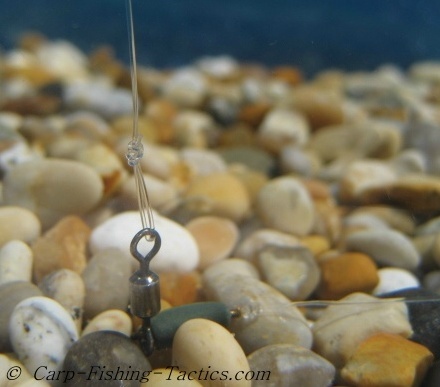 This type of set up allows you to change the bait very quickly between casts. The closeness of the boilie to the hook helps it to hide most of the hook from any carp passing above the bait. The clear shrink tube on the end also helps hide parts of the hook. 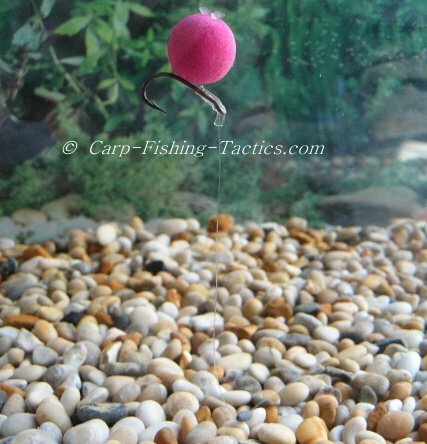 The position of the bait to the hook gives this rig a claw appearance, and this does improve its hooking ability. 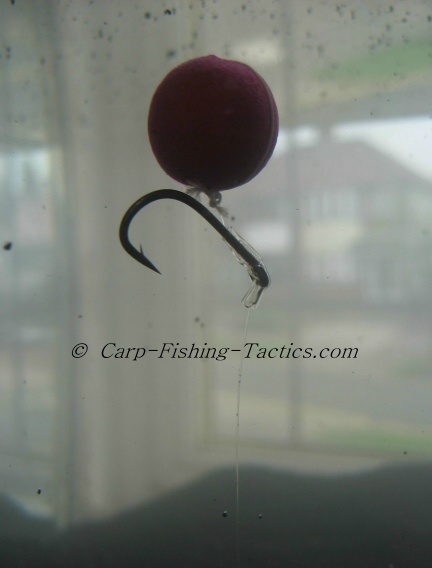 Same pop up fishing rig as one above but the boilie is tied on using bait floss. 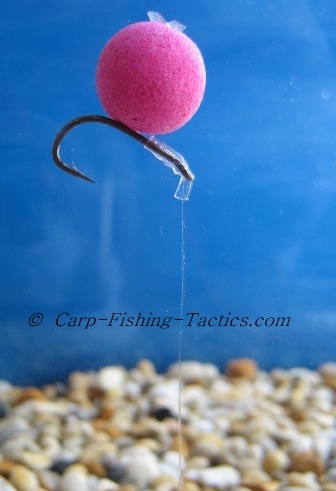 Using bait floss takes much longer to attach a bait and I don't think its as secure as other methods, however, the buoyancy of the pop up will last much longer in water, and thus is a good choice if the rig needs to be out in the swim for longer periods. Another version of a pop-up fishing rig is shown above. 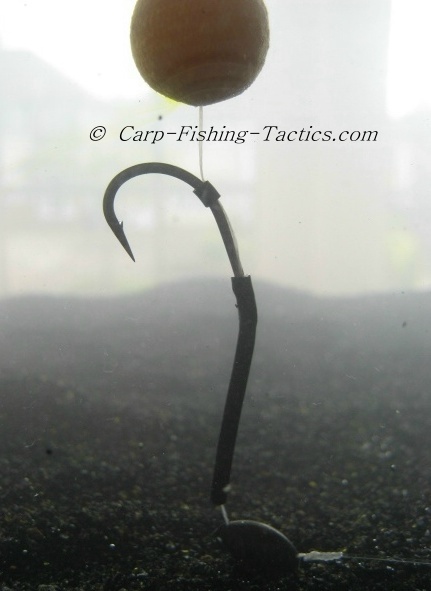 This uses an extended hook technique for better hooking efficiency. The shrink tubing is extended in a straight length towards a weighted bead. The additional hook length improves its hooking ability and the bead helps drive the hook point into the bottom lip of any feeding carp. Shown above is a different type of pop up presentation using a rig ring attached to a hair to form a "D". 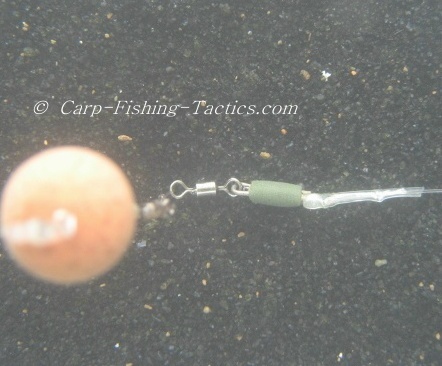 This allows the rig ring to move easily so the bait can separate away from the hook giving a more secure hook hold when playing a fish. 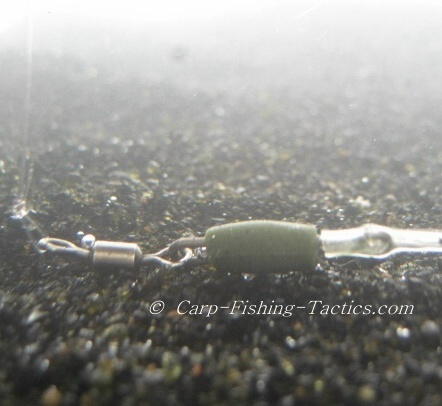 The boilie can simply be attached to the ring using bait floss. 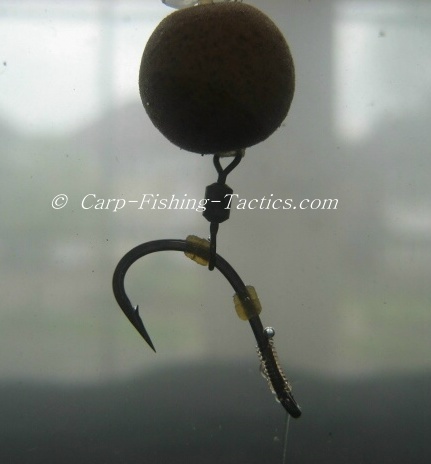 This is a pop-up rig that uses a hair to attach the boilie rather than a rig ring or swivel. I don't feel these are as good as the ones with ring but they do make for a different pop-up presentation. Sometimes the hair can wrap around the hook on casting, this may render the fishing rig ineffective when a carp takes the bait. 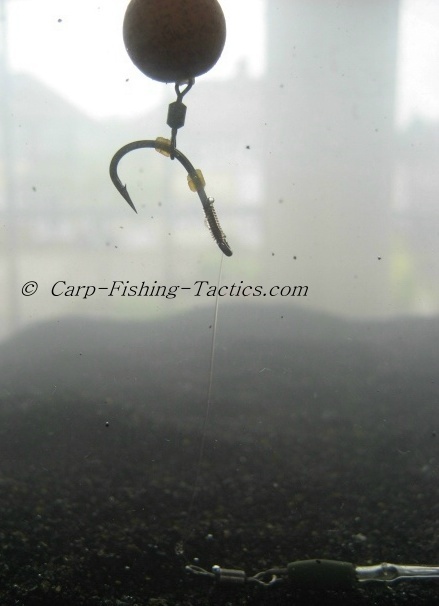 The carp rig shown above is normally used only for bottom baits. Here, I placed a pop-up boilie on the hair length to see what kind of presentation it would produce. Sometimes during hard fishing sessions, it can be a good idea to do something that is not normally considered correct in order to produce a bite! 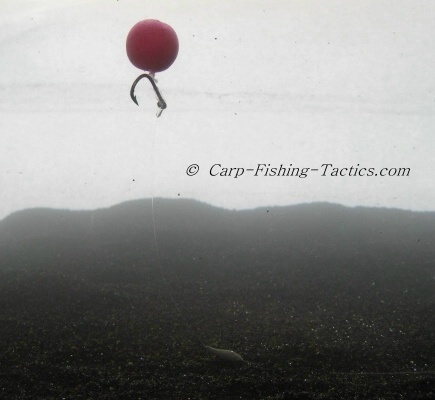 A pop up fishing rig presented on a siltbed, does it look right to you? 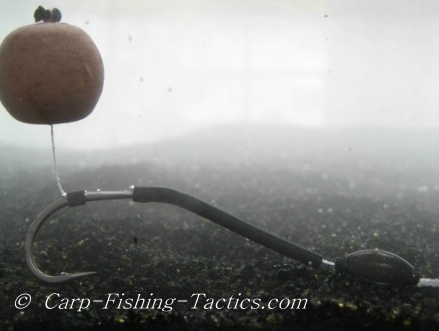 In the photo above we show what a pop up carp rig looks like when presented on a siltbed. This does not look natural at all, and I believe carp will also feel this way about this type of presentation. What do you think? There are hundreds of different ways to present a pop-up boilie on a fishing rig. It's always best to experiment with various types before concluding which one is best to use for each and every different fishing situation.